These bright Mediterranean stuffed zucchini boats make the perfect appetizer or side dish in less than 20 minutes! 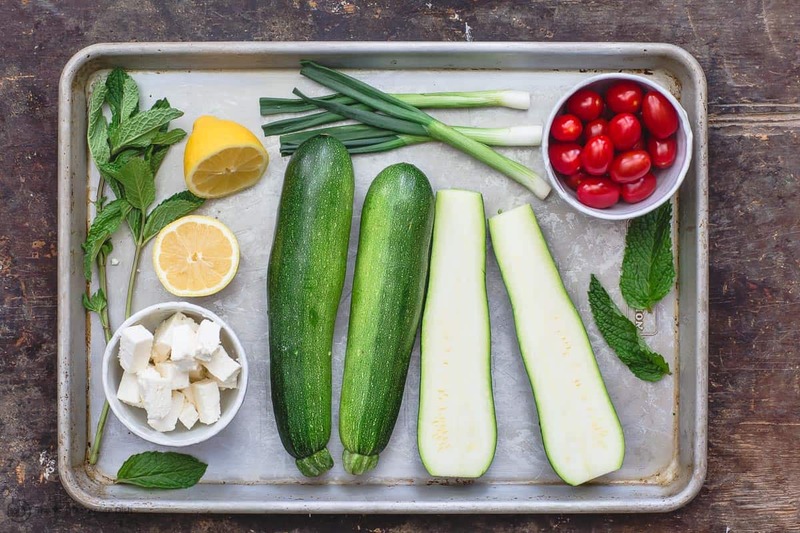 Tender, perfectly grilled zucchini halves stuffed with bright Mediterranean favorites like cherry tomatoes, feta, fresh herbs, and a little lemon zest. You can grill the zucchini outdoors or right in your skillet, delicious either way. And if you want to change up your zucchini boats filling, be sure to check out all the ideas below! Ideas evolve, at least good ones do. And food is no exception. I, for one, enjoy seeing beloved traditional recipes take on a new life turning into equally delicious, but, perhaps, more accessible options. Case in point: stuffed zucchini for the modern cook = zucchini boats! There’s a reason people go nuts for zucchini boats. They are easy to make–no special “cheffy” skills needed–and they just make the perfect carrier for whatever filling you like! Just for fun, when you hop on Instagram next, just do a quick search for #zucchiniboats and you’ll get something north of 13,000 ideas! 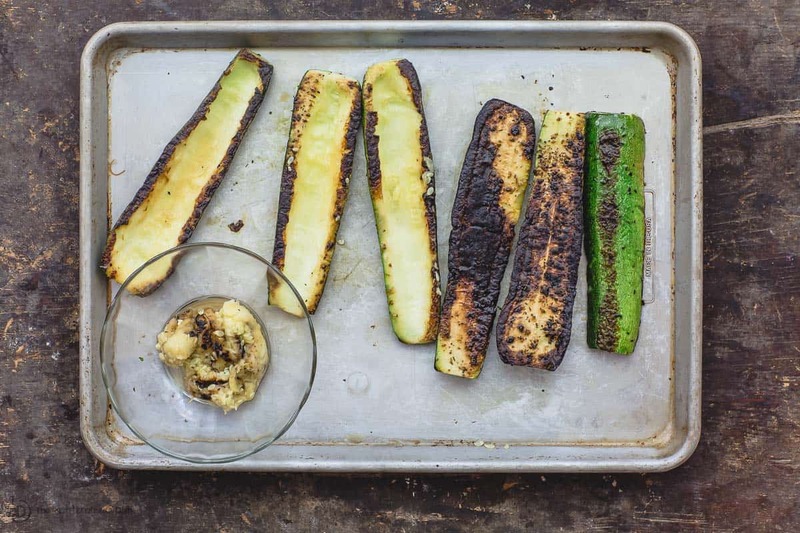 3.Turn grilled zucchini halves into boats by simply scooping the flesh out (do not discard the tender charred flesh, it’s so tasty). 4. Make a filling/stuffing for the grilled zucchini boats. The possibilities for the filling here are endless here (see more examples below), but I kept my filling simple, leaning more towards fresh and vegetarian options. To make filling, Combine zucchini flesh with Mediterranean favorites like tomato, feta, green onions, and fresh herbs. I love using a couple different herbs here like mint and parsley…so fresh! And if you like a little extra zest, then do as I have and add a squeeze of lemon juice. You can turn this into Zucchini Boat Antipasti (say that with an Italian accent, it’s fun!) Just give your filling/stuffing a little Italian flare using baby mozzarella, fresh basil, and maybe a little cured meat like Prosciutto or salami. If you’re up for a little extra work, then make the meat and rice stuffing from this stuffed pepper recipe (it does make more than you need for 6 zucchini halves, but then you’ll have more rice to eat later. Or, make more zucchini boats!) I like this option more if you were serving them for dinner. Mediterranean grilled zucchini boats are an obvious choice for mezze or appetizer hour. If you’re serving a larger crowd, you can cut the zucchini halves crosswise to create smaller “boats” that are much easier to pick up (no fork and knife needed.) A dollop of Tzatziki sauce on top doesn’t hurt a bit! Mezze platter; Chickpea Egg salad; Smoky Eggplant Dip; Kibbeh and the like are great items to add a long for a full grazing table. 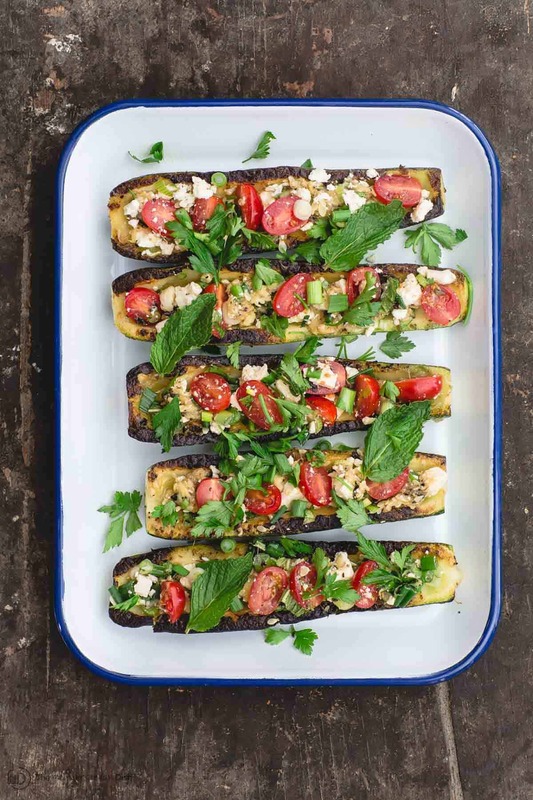 Or you can serve these grilled zucchini boats as a side next to things like: easy lemon chicken; Greek keftedes; Pan-Seared Trout; or Baked Salmon. 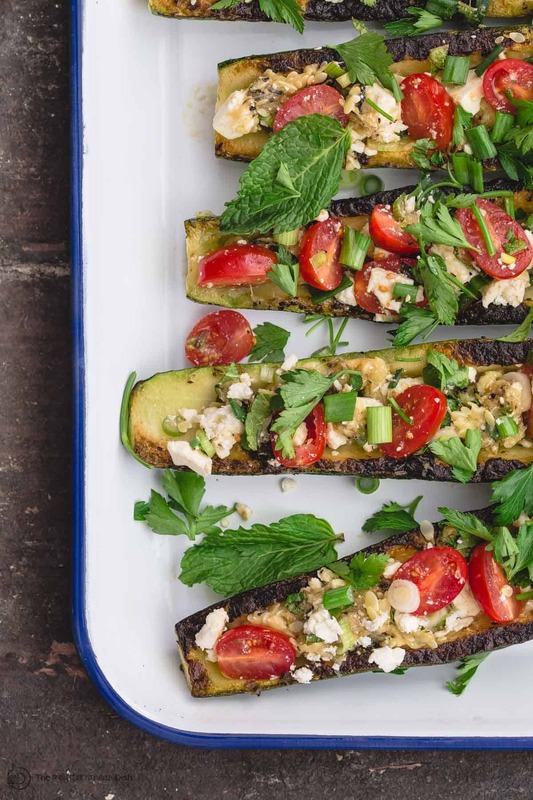 Easy grilled zucchini boats filled with Mediterranean favorites like tomatoes, feta, and fresh herbs. A bright and healthy appetizer or side! Be sure to check out the notes for tips and ideas. Brush zucchini generously with extra virgin olive oil on both sides. Season zucchini (particularly flesh side) with salt, freshly ground pepper, and oregano. Remove zucchini from heat and let cool enough to handle. Now add zucchini flesh to a mixing bowl. Add the remaining ingredients (cherry tomatoes, green onions, feta, mint, parsley, lemon zest, and small splash of lemon juice). Sprinkle a little more oregano, if you like, and add a drizzle of extra virgin olive oil. Mix everything together to make the filling. Spoon the filling mixture into the prepared zucchini boats and arrange on a serving platter. Enjoy! Cook’s Tips: You can cut the zucchini halves crosswise to create smaller “boats” that can be easily picked up by hand. This is ideal if you’re serving a larger crowd as an appetizer (yields 12 instead of 6). Cook’s Tip: A drizzle of Greek Tzatziki sauce really seals the deal on these zucchini boats. Find recipe for homemade Tzatziki here. Make Ahead Option: You can grill the zucchini ahead of time, then when ready to serve, follow recipe from step #5. 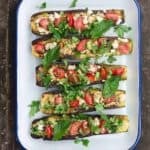 What to Serve Zucchini Boats with: Serve zucchini boats as part of a larger mezze or appetizer table next to things like, Mezze platter, Chickpea Egg salad; Smoky Eggplant Dip; Kibbeh and the like. 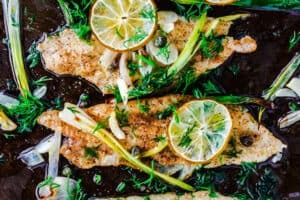 OR turn them into dinner next to your favorite protein like: easy lemon chicken; Greek keftedes; Pan-Seared Trout; or Baked Salmon. 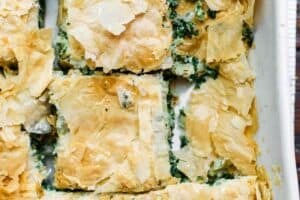 Other Filling Options: You can change up the existing filling in this recipe by simply adding more vegetarian items like a handful baby spinach, olives, or marinated artichokes. Or turn this into Zucchini Boats Antipasti. Just give your filling a little Italian flare using baby mozzarella, fresh basil, and maybe a little cured meat like Prosciutto or salami. 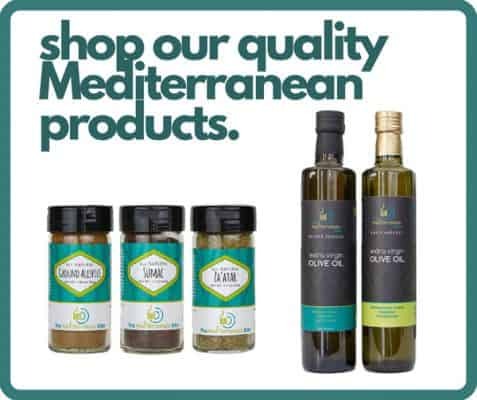 Visit The Mediterranean Dish Store for our Greek extra virgin olive oils and more! Our Early Harvest and Private Reserve extra virgin olive oils are both from organically grown and processed Koroneiki olives. And you’ll also find a selection of all-natural and organic spices for Mediterranean cooking. Try the Ultimate Mediterranean Spice Bundle, or create your own 6-pack of spices. *This recipe/article has been republished with new content for readers’ benefit. Looks so delicious and healthy! Perfect for a balanced dinner. It really is. Thanks, natalie! Wow and yum! These look delicious. I love zucchini and this recipe is right up my alley. It sounds like a delicious dish. The suggestion of making them with salami is great, I will have to try it, cheers! This is such a refreshing and delicious recipe! Thanks so much for trying it, Nellie! I love everything about this! I’m planning out my garden and looking for as many zucchini recipes as I can find- this one sounds AMAZING! Alright, Sarah! Can’t wait for you to try this when your garden zucchini are ready! How incredible do these look!? Anything with the word Mediterranean in the title makes me so happy! These are my favourite flavours, and I adore zucchini! Such a great summer recipe. It is a really good way to put all the zucchinis to good use. 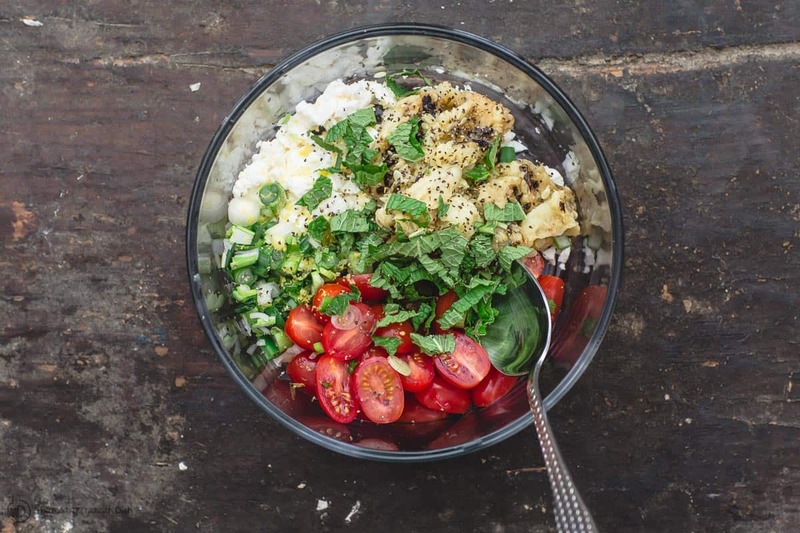 Can’t wait to use my summer veggies to make this! The zucchini was outstanding with bright colorful flavors. I loved the grilled zucchini. It was all going good till I made the tziki sauce. Well I love garlic but this may have been a little much. I will try again with less garlic. 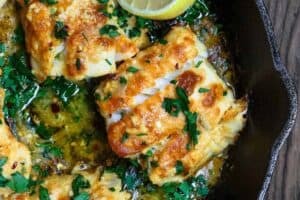 Fun recipe and super easy. The grilling adds such a flavorful note! It really does, Erin! Thanks for giving this a try! Such a beautiful, delicious side dish!! Can’t wait to make these again! Awesome, Liz! These have become on the regular rotation over here too! Oh yum!!! This sounds absolutely amazing! This is so delicious! Oh my gosh! I could eat them all myself! Winner winner! Thanks, Mary! This is an oldie-but-goodie recipe we love ! 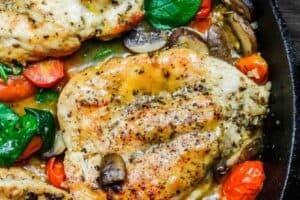 Super easy, super quick and absolutely delicious! Yay, Lisa! Thank you for sharing! Thank you for your recipe! My husband had supper mostly ready when I got home tonight. He was going to cook some spaghetti and add some zucchini noodles that he’d julienned. My job was to flavour it… I adapted your recipe for the flavour. It was SO delicious! Can’t wait to try it the way you wrote it! Awesome, Angela! Thanks for sharing! This is absolutely amazing! Delicious! Thank you very much for a great recipe. I made this tonight for dinner and it was one of the most delicious things I’ve eaten in a while. It’s so simple and uses stuff you have on hand which is awesome. Will defiantly be using this recipe over the summer when I can get zucchini from my garden! Thanks for the wonderful recipe. Wonderful, Erin! Thanks for giving it a try! 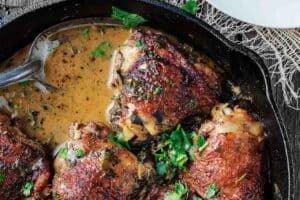 This recipe is so easy and full of amazing flavors, I followed the recipe the first time. However, for second time I made it my husband asked me to make the zucchini into boats and to over stuff them with the toppings. I make this recipe at least once a week, my husband loves taking them for his lunch and this is a man who wouldn’t eat zucchini a couple of years ago. Emilia!!! thank you! Your husband is on to something! I have actually since revised this recipe to make it into boats (carved out and all)…I’ll be sharing the revised version soon! Thanks so much! Wow… that looks so delicious! Hi Anne! Awesome!! I hope you enjoy it. I can never print your receipes. Why? Hi George…I am sorry about that. I’ve looked into it, and things look fine on our end. There is a print or save buttons in the actual recipe box, so that’s where it should print from. If you try to print from your browser otherwise, it might not work because there are a lot of photos on the page…so be sure to scroll to the actual recipe box and print from there. Or try a different browser, perhaps. If you are still having a hard time, please let me know via my contact form so I can pass it on. Thank you! Thanks, Malia! I hope you love it!